I would like to buy a semi-portable jack in case we have a flat. My house floor jack is too heavy and bulky to carry. I need it to work on a 24' 6" trailer with tandem spring type axles. The trailer weighs less than 5,000 lbs. Any suggestions? ANSWER Hi Bob I have a real quick answer for you. I would take a look at some Hydraulic Bottle Jacks. I cannot tell you which one would be the best for you. You have to determine how high the jack has to lift your axles to get the tire off of the ground. For safety reasons I would also recommend that you get some Jack Stands to support the weight of the axle and tires while changing the tires. The hydraulic bullet jacks have a very small surface that contacts what you are lifting and the vehicle could fall while you are trying to loosen or tighten the lug nuts on the tire. WARNING: Because of the way that these hydraulic jacks are designed they should only be used on firm, level surfaces. The bases of these jacks are not very wide and they could tip over easily. One thing I would suggest is to get some 3/4" exterior plywood and cut some 1' X 1' squares to be used as a base for the hydraulic jack and jack stands. These are especially useful if you are using the jack or stands on hot asphalt or sandy surfaces (the jack and stands could sink into the ground). If you are in an area where you are not sure if it is safe to use the hydraulic jack, you should call a tow truck company and have them come out and change the tire for you. The cost of a tow truck is well worth it; if it prevents you from becoming injured while changing a tire. Hopefully, this information has been helpful to you. If any of our visitors have suggestions for you they can add them to this page by clicking on the add a comment link located near the bottom of this page. If you ars set on having a floor jack, Harbour Freight and Tools has a number to choose from, different weight specs, but they have some very hefty ones that are very light and easy to carry. I believe they are considered a race car jack as they are able to raise a load very quickly. Harbour Freight is always having sales and lots of weekly coupons so you can get one quite reasonably. I used to carry blocks of wood. I had a tire disentegrate on the way to FL from New England. 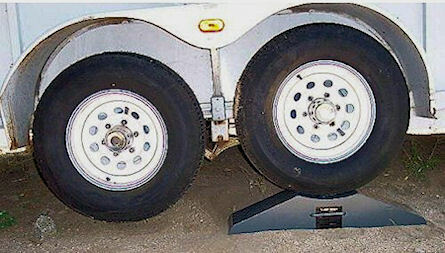 I have seen those plastic ground chock like platforms that you can buy at any RV supply place. They work by driving the non-flat tire on the other tandem axle up on the device and that would put the flat tire up in the air off the ground for changing. It seems this would be the safest way to go. In fact, my DH is going to make us one to carry with us out of thick wood boards fastened together at a sloping angle. Hope we never have to use it, but you never know what will happen out on the road! Comments From RVing Al Thanks this is a great alternative to a regular jack for trailers with tandem axles. Take a look at the picture below to see what these platforms known as "Trailer Aids" look like. For those of you that do not want to make your own you can also buy these Trailer Aids from Amazon.